THIS ATTRACTIVE VINTAGE BROOCH IS MARKED CORO STERLING CRAFT. IT DATES FROM SOMETIME IN THE 1940'S OR 1950'S. 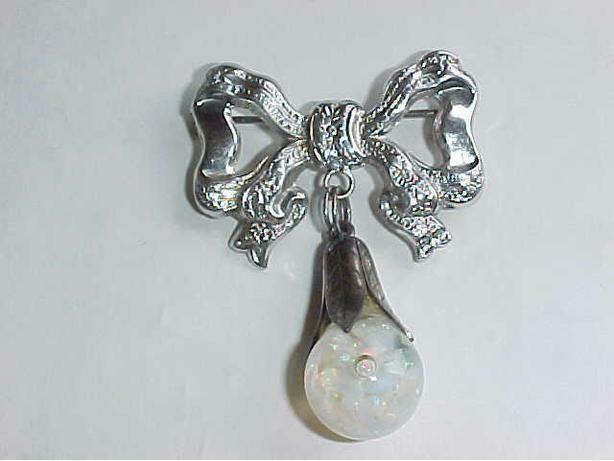 IT FEATURES A FLOATING OPAL DANGLING PENDANT DANGLING FROM A TIED BOW. IT MEASURES 1 3/8" BY 2" INCHES. IT IS IN EXCELLENT CONDITION. FOR OTHER VINTAGE COLLECTABLES, ANTIQUES AND ITEMS OF HOUSEHOLD INTEREST PLEASE VISIT MY OTHER ADS.